Columnist Miguel Cima, director/host of the award-winning documentary Dig Comics, looks at what makes comics so great, and what’s holding them back. I’ve been interviewing comics professionals for years now. That means creators, publishers, retailers, distributors, etc. And of course, I talk to comic book fans all the time. There’s always the same debate, running around the same old question: just how bad of a state is the comics industry in? The answer bounces all over the place. For many fans, the dedicated hobbyists who loyally show up every Wednesday, it’s not a thought they consider. The books they want keep showing up. They live inside their own consumer bubble, and so long as the fountain issues forth sequential refreshment, they show up and go about their business. Amongst the professional class, the debate gets a bit more…iffy. I could say, on the whole, pros are weary of sluggish sales, not seeing the needle move too much. Most retailers especially feel the pinch. And why not? Something like 50% of comic stores have closed up shop in the last decade or so. Friends of mine who run stores often complain of their struggles. One owner I know has even taken a second job to make ends meet. An owner! As for creators, only the very top dogs in the game seem to be feeling fine. In 2007, Jeph Loeb contested outright my suggestion that comic readership is on a decline. And recent data, showing modest growth in recent months, has had comics journalists decrying any of the doomsayers predicting industry decline. Well, that’s only a 17% rise. But we didn’t count DVD’s, downloads, broadcast rights…and again, this was just US numbers, not all of North America. Not a fair comparison? Movies have so many more ways to make money, right? And they are so far better marketed. Besides, nobody reads these days anyway, right? I mean, what about books? They must sell worse than movies, right? Well, while getting exact numbers from the book publishing business is not too simple, The New York Times reported that US book sales in 2012 were somewhere over $15 billion, increasing from around $14 billion in 2011. Yes, you read that right. Books do better than box office, people. So let’s get over this “people don’t read” nonsense. They do. And besides, comics are NOT strictly reading. They are much more than that, a visual medium first. OK, so what’s my point here? First, comic books are outclassed in US sales by 20-40 times by their cousins, literature and cinema. Second, in light of the fact that comics fall squarely between these two medias, there’s no reason to believe we can’t find similar audiences for them. So when pundits get all high and mighty about a blip here, a good month there – forgive me if I don’t get too excited. Comics were once ubiquitous in America, just like movies and books. They are just as worthy of public attention, in many cases, far cooler than what Hollywood dishes out. Expectations within the comics industry are always for slow growth. There seems to be little appetite for a serious push to explode the numbers into the billions. Partially, this is a function of 70% of the market being controlled by two multi-media conglomerates, seemingly content to merely convert their comic trademarks into film, TV, video game, apparel and toy products. My dream is to stand before board meetings at Disney (who owns Marvel) and Time Warner (who owns DC) and ask a really stupid question: Would you guys rather see your comics publishing division sit around $500 million, or would you rather it hit the multiple billions? Stupid question indeed. But the comics industry itself doesn’t seem to want to bring that up. Dig Comics does. 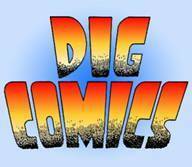 Dig Comics seeks to exceed expectations and more. And we know that this change has to come from outside. People don’t read comics you say? Fine. Let’s bring them our world via film and TV – that’s where the eyeballs currently sit. Help us show America what they are missing. It’ll be good for education, for cultural enrichment, for intellectual growth – and even for the comics industry itself. Argentinean-born New Yorker and NYU film school graduate Miguel Cima is a veteran of film, television and music. He has worked for such companies as Warner Bros., Dreamworks and MTV. An avid comic book collector since he could read, Miguel began writing stories in 4th grade and has not slowed down since. He is a world traveler, accomplished writer, filmmaker, and comics creator. He is the writer, director and host of the award-winning documentary Dig Comics. Follow Dig Comics on Facebook. Read more of Miguel’s comic book recommendations. Posted on June 26, 2013, in Dig Comics. Bookmark the permalink. 1 Comment. Let’s not forget that the average price for a comic from 2003 to 2012 went up more than 25%…which would account for the total dollar count for comics. The more important numbers are units sold and customer base…which have been stagnant or shrinking for many years.